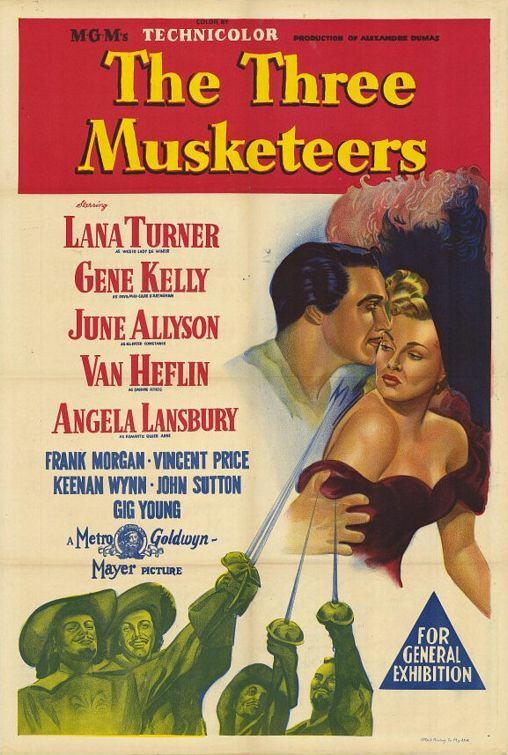 An aspiring musketeer (Gene Kelly) in 17th century France joins veteran musketeers Athos (Van Heflin), Porthos (Gig Young), and Aramis (Robert Coote) in their efforts to protect Queen Anne (Angela Lansbury) against the evil intentions of Richelieu (Vincent Price) and his henchwoman, Lady de Winter (Lana Turner). Fans of Alexandre Dumas’ swashbuckling classic will likely be the primary audience for this colorful literary adaptation, produced by MGM Studios and starring a host of big names in key roles — most notably Gene Kelly, who was excited about the opportunity to recreate the role (D’Artagnan) originally inhabited by his idol, Douglas Fairbanks, Sr. There’s plenty of intrigue in the plotting-rich narrative, and those already familiar with the basic storyline and characters in Dumas’ serialized novel will fare best at puzzling out exactly what’s going on, and who’s attempting to do what to whom (and why); if you’re at all distracted while watching, however, you may find yourself a bit lost at times — though it’s never anything but clear who are the good guys/ladies (this group includes June Allyson as D’Artagnan’s instant beloved, Constance) versus the bad guys (guess which side Vincent Price falls on?). Personally, I find the production both overly comedic (Kelly’s performance in particular borders on clownish-ness) and far too melodramatic (Kelly and Allyson’s romance is never anything less than full-throttle — complete with overly strategic use of the infamous melody “Hearts and Flowers” whenever they’re together). 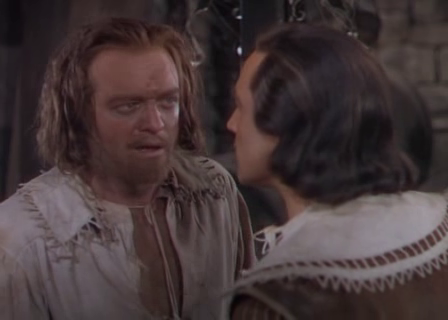 Note: Van Heflin gives the most impassioned and nuanced performance in the film, playing Athos with an appropriate level of brooding; whenever he’s on screen, one can’t help becoming absorbed in the story. No; this one is only must-see for fans of the book or the genre. I’m kind of surprised I didn’t see this when I was a young ff. It probably was shown on tv when I was growing up but I don’t recall. Of course, I was never big on this particular tale (pirates, yes; musketeers, not so much), so that may account for that. But what an odd movie. 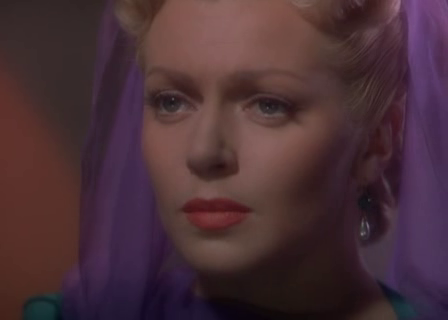 A classic novel gets the MGM glam treatment here and, though it may work on some level as popular entertainment, it comes up wanting. The main problem appears to be that director George Sidney couldn’t get his cast to agree on a proper group tone. So some cast members’ acting styles seem to be at odds with others. ~which is why, I think, Heflin stands out as memorable; he is one actor here who seems to have hooked into an appropriate style for the material. Dependable Keenan Wynn is another who has caught on to what’s needed. Likewise Frank Morgan and a few others. Turner and Allyson are ok but not much more. The biggest ‘offender’ here is Kelly…which is strange because he has shown in other films that he is capable of range. But as D’Artagnan he is largely at sea and usually reverts to what he learned as a musical comedy star (which here unfortunately translates as ‘ham’). Those tuning in (as I did) in the hope of finding compensation from Lansbury and Price may be disappointed: neither one has all that much to do, though they both underplay admirably. Note on the look of the film: Having recently been accustomed to seeing films in blu-ray, I couldn’t help but notice how washed-out this film looks by comparison (since it is not yet available in blu-ray). 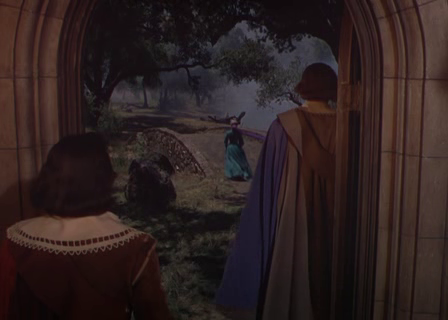 I’m certain the film would look much better, and have some of its ‘former glory’ restored if it were transferred. Not that that would make it a better film overall, but it would certainly be a prettier one.